I am in Chicago where I was supposed to be having dinner with Groupon CEO Andrew Mason last night, a dinner planned more than a month ago when I bought my plane ticket. Instead, he has suddenly decided to go to China. It was bad news for me, but good news for anyone looking to buy shares in the company. Also good news: TechCrunch has learned that Groupon’s sprawling, costly international operations have recently been brought back under control of Groupon’s more rigorous US management team. This all matters greatly for potential investors, because as the S1 showed, much of Groupon’s warchest of venture capital has gone to its aggressive international expansion. As we reported last week, Groupon’s U.S operations lost only $10.4 million last year, whereas the international operations lost $170.6 million. Much of that has gone to China. Five days after Groupon’s January near-$1 billion venture round was raised, a job board advertising Groupon positions in China boasted “near endless” resources from that round to build out the office. Reading that ad and looking at how Groupon has done in China, one could argue not all that money was, shall we say, judiciously spent. A more blunt way of putting it would be Groupon’s China team made drunken sailors look fiscally responsible. Despite Mason’s blithe statements to the contrary on stage at All Things D, China is not going well for Groupon. 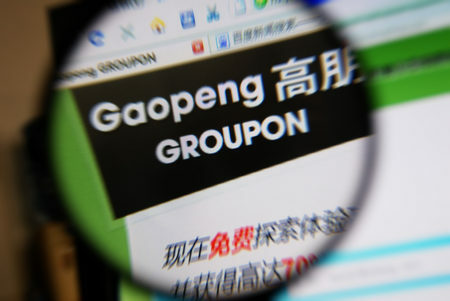 In fact, by all accounts, Groupon has made every classic Silicon-Valley-Web-company-enters-China mistake in the book: Sparring with its local partners, putting foreigners who have little understanding of the local market in charge, and focusing hiring on bankers and international MBAs, not locals. Up until now, Groupon’s international operations were run out of Germany by those famously wealthy German Internet tribute artists the Samwer Brothers. Now that the Samwers have transitioned out of the company, TechCrunch has learned that organizational structure is changing radically. All international operations have been brought back under the US headquarters, reporting to new COO Margo Georgiadis, and judging from his sudden travel plans, Mason is getting more involved too. I discovered this on my recent trip to Berlin, where I was supposed to meet with someone to talk about the company’s sprawling international operations– also a long planned meeting. This one wasn’t cancelled, but I was told just before that the person I was meeting with could only speak about the German market, and that all questions about the broader international strategy had to go through the US. Nevermind that all my previous inquiries about Groupon’s international operations had all been referred to Germany. It seemed no one was able to comment on the leviathan sucking up hundreds of millions of dollars in investor cash. After much back and forth, I was finally told that the confusion stemmed from the very recent change in who all the international divisions reported to. Now, it’s Georgiadis. When I asked to speak to Georgiadis about the change, I was told the move was so recent she hadn’t even yet had the chance to check in with all of the country heads. (We hear she’s traveling in Europe now, presumably doing just that.) Then, I was told Mason could speak about it at our dinner….which got subsequently cancelled. And all of that was before the quiet period. Now no one is telling me anything about anything. No one has gone so far to say on the record that the company was unhappy with the job the Samwers did running international operations, rather the official line is that it was a long-planned transition to be implemented when the Samwers left the company. But the impression I’ve gotten from talking to people inside and close to the company is that this is most definitely a good thing. Indeed, the Samwers have had a mixed record with Groupon’s international operations. Some countries have gone well, some have had early hiccups but are doing better now, and some don’t seem to be going well at all. In many markets Groupon is a solid number two player at best. In Brazil, for instance, Peixe Urbano does better than Groupon; in several of European markets a consortium owned by angel investor Klaus Hommels beats Groupon, and in China a company called Lashou just dominates. One of Lashou’s investors, GSR Ventures told me several weeks ago he estimates Groupon does just one-tenth of Lashou’s volume in China. “The nature of the business is it’s quite easy to tell how things are going,” GSR’s Richard Lim says. “You just have someone go look at the site and see how many deals they have and how much they are discounting each deal.” Groupon tried to buy Lashou for hundreds of millions of dollars months ago, only to be rebuffed. It has since raised more than $100 million at a $1 billion pre-money valuation, GSR says. Like Groupon, it’s growing insanely fast, eyeing its own high dollar IPO in the future. No matter what Groupon’s management changes say about how things have gone in the past, the fact that Groupon’s management team is taking a more central role in running what’s been a runaway cash-spending train is no doubt good news for potential investors. It’s hard to imagine there won’t be some changes and new discipline instiled. Maybe Groupon will pull back; maybe it’ll get more aggressive. But I’m betting from now on Mason will have a better idea what’s actually going on in one of the biggest markets in the world. I can only hope for a future where someone at the company is able to answer basic questions about the company’s biggest cost center. After all, investors probably won’t be quite as forgiving as the press.